How much time do you spend examining new ad platforms to decide which ones you should test? For that matter, how much time do you spend simply testing each of those networks you find? What if you knew a way to test multiple networks simultaneously? And at a fraction of the time spent. It’s not a pipedream and it’s what I would call “pushing the easy button” to scale your campaigns – saving you time and money. You can achieve this goal when you use a Demand-Side Platform (DSP). I won’t go into the technical details, but DSPs allow you to access large-scale inventories of digital ad space in real-time, across the web… and the world. Real-time bidding alone gives you enough benefits to make a DSP worth the learning curve. Because you can avoid bulk buys of (inefficient) ad space and enforce frequency caps in bulk, you can see some serious cost reductions and marketing efficiency. DSPs determine which impressions are likely to be more valuable for your campaign efforts and therefore they can help you to minimize wasted spend and increase potential ROI. When it comes to advanced targeting and features, DSPs definitely deliver. Similar to Google Ads, you’ll find a variety of targeting options available, from contextual to demographic to behavioral. You’ll also find features like day-parting, frequency capping and creative management. The spectrum of data and real-time nature of reporting on DSPs allow advertisers to be agile in their marketing efforts. You might think that DSPs aren’t any different from Google Display Ads because they both offer the ability to display ads on a large number of third-party websites. However, where Google only provides access to their own network of publishers a DSP provides access to a bigger range of publishers that are part of a vendor-neutral, real-time bidding ecosystem. This ecosystem is far larger than the Google Display Network – so you really get to cast your net far and wide. In fact, some DSPs even allow you to access inventory that is on the Google Display Network via the Google/DoubleClick Ad Exchange, which you can’t access directly via Google Ads. This means that if you want to expand your reach, you must use a DSP to access this inventory. Having said that, DSPs also shouldn’t replace Google. Much of the Google inventory is only available direction through Google Ads. As a general best practice, I suggest that marketers use multiple DSPs to reach not only that greater scale that’s available, but also to take advantage of audience data and leverage different features, rates, and levels of support. One of our current favorites is Zemanta, a Native DSP owned by Outbrain. We’re particular fond of Native ad networks because we’ve seen great results on these platforms. However, trying to access all the individual platforms can become a time-consuming mess. With Zemanta, you can access 40 different networks with a single campaign, in an easy-to-use interface. Yes, that does include Google inventory as well, but that’s not (the only reason) why we’re recommending it. Not only that, but the campaign creation interface makes it super simple to select the campaign type that best matches your goals. But before you even start creating your campaign, there’s also an inventory planner that will help you determine where you want to advertise – from the country to the publisher. Not all DSPs are created equal. But it’s worth testing a few to find a combination of DSPs that serve your needs. You’ll quickly and easily add scale to your marketing efforts. And that’s a goal we can all get behind. 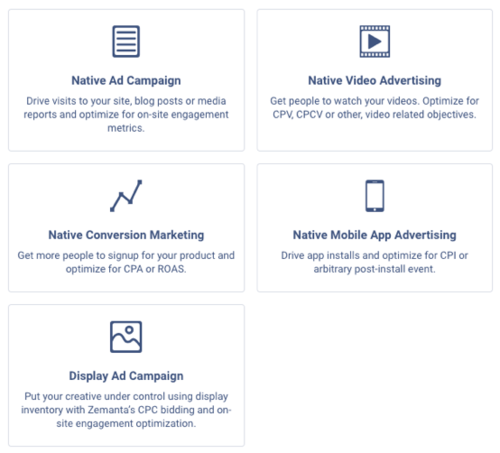 Apart from Zemanta, you may also want to explore other DSPs like AppNexus, Oath, and RocketFuel.